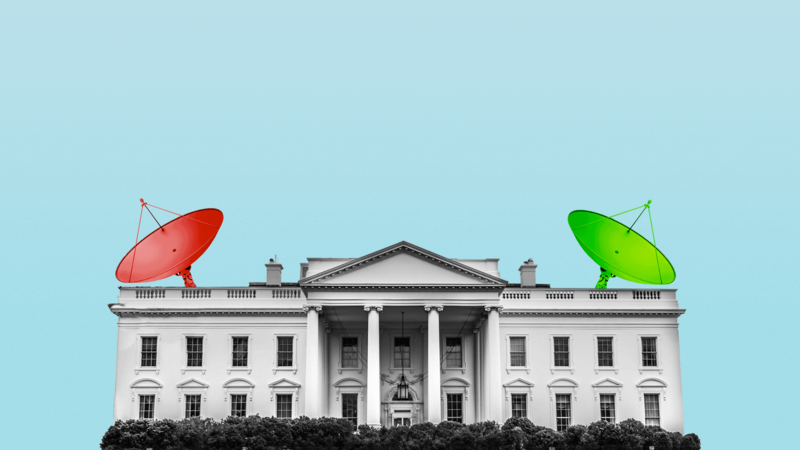 Mergers are central to media companies' strategies for competing with tech giants like Google and Netflix, but the merger review process has suddenly become a political football between President Trump and congressional Democrats. The letter was made public Monday after a Friday report from The Information that Comcast/NBCU and AT&T may be working together to share content to marginalize rivals. Trump then tweeted about the industry group's lawsuit, asserting that "Comcast routinely violates antitrust laws." A DOJ spokesperson alluded to Axios last week that AT&T's failure to come to a carriage agreement with Dish stems from its desire to steal Dish's Pay-TV subscribers, which would be an antitrust violation. Not everyone sees it that way. "I certainly was very happy to see the president focus on this issue," ACA President Matthew Polka tells Axios. The resignation of Attorney General Jeff Sessions has some policymakers concerned that his acting replacement Matthew Whitaker, a Trump loyalist, will push Trump's agenda — renewing fears that the DOJ's antitrust division isn't independent from the White House. Between the lines: Many of the alleged anti-competitive behaviors are related to outlets that President Trump has attacked. NBC: The president has now vocally supported probing Comcast's behavior after its merger with NBCU in 2011. He's also attacked the network's broadcast licenses in the past, even though those are controlled by local affiliates and Trump can't take those away. The Washington Post: The Post is owned by Jeff Bezos, who also owns Amazon. The president has attacked The Post for being "fake news" and has simultaneously said he is looking into Amazon's dominance and has reportedly gone after the company's U.S. postal rates. CNN: CNN is owned by WarnerMedia (formerly called Time Warner), which was acquired by AT&T in June. Trump vowed to break up AT&T's merger with Time Warner on the campaign trail. The DOJ tried to block the deal but lost the case in court. Trump criticized the deal's approval. Democrats allege Trump impacted the DOJ's decision-making. — Incoming House intelligence committee chairman Adam Schiff in an interview with Axios' Mike Allen. Reality check: Schiff’s comments carry weight because of his prominence in the Democratic party. But Schiff's committee doesn't have oversight authority on antitrust matters. Democrats in Congress have already requested documents related to communications between the White House and DOJ about the AT&T deal. The bottom line: The president isn't supposed to inject himself in these matters. Suzanne Nossel, Chief Executive Officer of PEN America, a non-profit that defends the First Amendment, says Trump "crosses a line" when he "actually does engage the machinery of government to retaliate against journalists and media outlets." Media and telecom deals continue to slightly increase under the Trump Administration, with PwC's latest US Media and Telecommunications Deals Insights Q3 2018. Deal volumes (number of deals, not how much they are worth) reached a two-year high last quarter, after a moderate slowdown in the first half of 2018. Yahoo Finance, the decades-old money brand now owned by Verizon, is launching a subscription service that aims to compete with Bloomberg for the money and attention of retail investors, sources tell Axios. The big picture: The move is part of a larger trend of digital publishers creating new revenue streams out of subscription and membership offerings. On Monday, New York Magazine announced a forthcoming digital subscription offering. What we're hearing: Yahoo Finance Premium will act as a testing ground for Verizon Media Group (formerly called Oath) to launch more subscription services. Verizon Media Group houses many smaller brands that have niche audiences, like TechCrunch, Engadget and Yahoo Sports. TechCrunch currently leverages its deep relationship with tech wonks to monetize big conferences. Yahoo Sports does the same thing with fantasy sports. The service is slated to launch in the first quarter in 2019. Subscribers will be able to access to financial data tools, proprietary data sets and industry research, on top of Yahoo Finance's free journalism and financial content. The company is still experimenting with what a cost structure might look like, but given that it is aimed at a retail investor, it will likely cost $100+ monthly, according to a source familiar with the pricing structure. Between the lines: When Oath was created in 2017, executives pitched its advertising business as being a serious ad competitor to Google or Facebook, but it has thus far failed to position its growth to take on those companies long-term. It now expects to grow its ads business by just 2% over the next four years while Amazon expects its ads business to grow 45% by 2020, per eMarketer. The group's leadership team has been gutted over the past few months. CEO Tim Armstrong exited earlier this year, which signaled to investors that newly-formed conglomerate may be struggling to find its footing in ads. Executives said last month that Oath, which consists of AOL, HuffPost, Yahoo and other digital brands, is struggling to drive revenue. It later announced that it would rebrand Oath "Verizon Media Group." The bottom line: Yahoo Finance is still a powerhouse brand. And despite slowed ad growth projections, Verizon Media Group/Oath is still a traffic behemoth. Yahoo Finance reaches 91 million monthly active users on mobile and desktop, per comScore, which is bigger than other finance news franchises, like Forbes Digital, and even major tech platforms, like Reddit. Oath last month had higher combined traffic on desktop and mobile than Amazon, Comcast/NBCUniversal, and Twitter, per comScore. News verticals that once brought in big subscription dollars and advertiser interest, like Auto and Arts, are being replaced by new-age topics that are relevant to understanding the world today. Why it matters: Before newsrooms began to invest heavily on covering these topics, experts typically resorted to Medium or LinkedIn to post about industry advancements and news. Now, news publications have a wider audience for these types of stories, as technology becomes a bigger part of everyday life. Between the lines: Advertiser interest around some of these topics is exploding. As the space race becomes privatized, companies like Boeing, Lockheed Martin and Raytheon are interested in messaging their space efforts to corporate decision-makers. Tech giants like Google and Facebook are investing millions in budgets to explain how much they are fighting misinformation. Retail and manufacturing giants, like Walmart and GE are that retraining workers and rebuilding their supply chains, are investing millions of dollars to sponsor future of work sections and conferences. Why it matters: Pay-TV providers haven't been able to come close to offsetting these losses with gains in subscribers to digital TV alternatives, like AT&T's DirecTV NOW or Dish's Sling TV. Between the lines: Both Sling TV and DirecTV Now are seeing slowed growth, making it even less likely that those digital alternatives will offset traditional subscriber losses for the two biggest pay-TV companies. This could be because there's so much competition from other digital live TV alternatives, like Google's YouTube TV and Fubo TV, as well as non-live TV alternatives with original programming, like Amazon and Netflix. The big picture: There are roughly 120 million TV homes in the U.S., per Nielsen, and about 90 million of them (75%) still pay for traditional TV. LinkedIn will be holding an exclusive press event today, where it's expected to reveal some new stats about revenue for its media business. The company hasn't revealed much since it was acquired by Microsoft in 2016, but has pushed to grow its ad business via more feed content. Facebook is facing pressure from five parliaments around the world that are taking to social media to have Mark Zuckerberg meet with them. Snapchat VP of content Nick Bell is leaving the company, the executive told employees Monday. Bell was instrumental in building out Snapchat's content platform, Discovery and for pioneering vertical video as a medium. He joins a long list of C-suite execs that have left the company since its IPO last year. Twitter CEO Jack Dorsey said Monday that the tech giant is considering creating an edit button but worries that it could be used by people to change the original meaning of a tweet. Fortune magazine has been acquired by Thai businessman Chatchaval Jiaravanon for $150 million, in just the latest example of a Western business publication ending up in the hands of an East Asian buyer, Axios' Felix Salmon writes in his Axios Edge weekly newsletter. Quartz was bought by Uzabase, a Japanese company about $100 million in July. Forbes Magazine sold a controlling share to a mysterious Hong Kong-based group named Integrated Whale Media Investments 2014. The Financial Times was sold to the Japanese company Nikkei for $1.3 billion in 2015. Be smart: The day might not be that far off when there are no major American-owned business publications at all. Business Insider sold to Axel Springer, a German mega-publisher, in 2015. The Wall Street Journal, owned by the Murdoch family, could also sell. Speaking at a conference last week, Lachlan Murdoch is didn't totally dismiss the idea of whether his father Rupert might sell the Wall Street Journal. Between the lines: There are many different reasons foreign investors want to get their hands on prestigious American titles. Some may want to grow the brands internationally, as seems to be the case with Jiaravanon and Fortune. Others may be interested in acquiring talent and insights into how successful American media companies operate, like the Axel Springer and Business Insider deal. Salaries for media and communications jobs tend to lean higher for writing-based roles, according to data from the U.S. Bureau of Labor Statistics. "Technical writers" are people who use journalistic skills to produce non-journalism related work, like brochures and how-to guides. "Writers and authors" are people who develop written content for various types of media, including advertisements, books, magazines, movies, plays and television scripts, and blogs. Nearly all of these professions, per the Bureau of Labor Statistics, require a bachelor's degree. The big picture: The median weekly salary of the nation's 117.2 million full-time wage and salary workers was $887 in the third quarter of 2018, per the Bureau of Labor Statistics, which comes to roughly $46,0o0 per year.